During a recent trip to a Lansing gorge, I was introduced to an interesting evergreen fern, Pellaea atropurpurea (purple cliff brake). It is fairly small, and does not attract attention like a large clump of Christmas fern (Polystichum acrostichoides) or marginal wood fern (Dryopteris marginalis), two of our region's common evergreen ferns. But it is one of those gems that forcibly reminds me to appreciate one of the Finger Lakes' characteristic habitats - lime outcrops and exposed shale in gorge walls - for those are the favored habitats of this little fern. Although purple cliff brake is native to a very wide region (Guatemala to southern New England & Canada to Florida), the descriptions of where it is found within its native range are all a variation on "dry, limestone rich cliffs and outcroppings". I gather that purple cliff brake can grow under other conditions, but is most common on these dry, limey situations or in the soil immediately adjacent to outcrops. This is particularly interesting to me, since the specimens I saw were just above the high water line in the gorge, along with some rather robust mosses. I would guess that the area is moist at least part of the year, although it probably bakes in the summer. Identification: Pellaea atropurpurea is fairly distinctive, particularly if you look during the time of year when deciduous ferns are browning or absent. 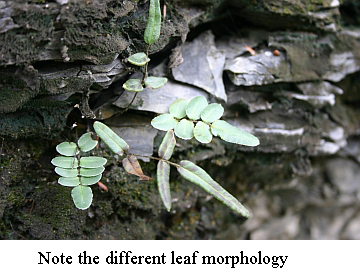 The overall look is an asymmetric clump; the leaves are growing from a rhizome and are slightly dimorphic, i.e. 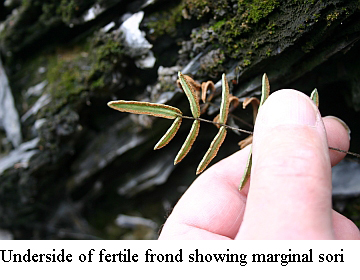 the fertile fronds are longer and more divided than the sterile fronds. The stipe (leaf stalk) is thin, wiry, and hairy, especially on the upper surface and colored dark purple or black. Although the fern is often described with blades from 2 inches to a bit over a foot long, the ones we saw were on the short side. According to the Flora of North America, some P. atropurpurea populations have hybridized with other Pellaea species. Luckily for Finger Lakes plant lovers, these are found west of our region. Blade: usually 2-pinnate at the base, but sometimes only once pinnate, elongate-deltate to lanceolate, leathery, rachis hairy, sparsely villous below near midrib of ultimate segments. Pinnae: 5 to 11 pairs, bluish-green, lower pinnae stalked, upper sessile, terminal pinnae like the upper lateral ones; pinnae perpendicular to rachis or ascending, not decurrent on rachis; pinnules (leafules) sessile or nearly so; veins obscure; margins weakly recurved to plane on fertile segments. Spores are clustered at the edges of the pinnules. Pellaea glabella, the smooth cliff brake, is similar to P. atropurpurea, but differing in its monomorphic leaves, smaller size, and particularly the glabrous stipe and rachis. (The key point is that the wiry stalk in the middle of the frond is not hairy like the purple cliff brake.) Pellaea glabella is not nearly as common as the purple cliff brake in the Finger Lakes region, in fact P. glabella is threatened in New York (Weldy and Werier 2008). But you might find some. 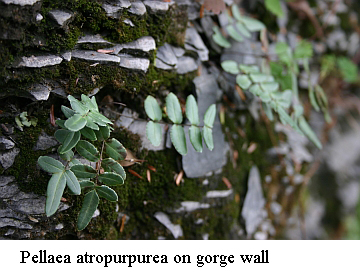 Status: Pellaea atropurpurea is protected in New York State as "exploitably vulnerable", a status given to species which have sufficient population so long as collecting is prevented. Pellaea atropurpurea is endangered in Florida, Iowa & Rhode Island, and threatened in Michigan. (USDA Plants). Growing and Propagating: The purple cliff brake grows in full to nearly full sun in dry limey conditions. It can be propagated by spores, which ripen June-September. 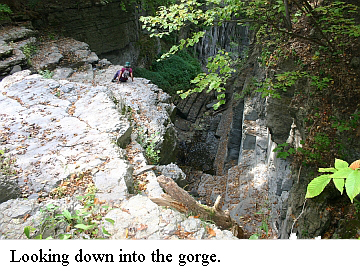 Rock gardeners with crevice beds can provide the correct conditions (Goroff 2001), but most of us will have the fun of scrambling over the rocks to see it in a natural habitat. So, next time you find yourself next to a shale cliff, look even closer. References: Note that the identification section above is a composite of all of these sources. Weldy, Troy and David Werier. 2008; New York Flora Atlas.